Dr. David Hayes-Bautista’s book, The Cinco de Mayo in California, details the real history behind this American Civil War holiday. Los Angeles, CA- With the 150th anniversary of the first Cinco de Mayo coming up in 2012, Dr. David Hayes-Bautista’s latest book, The Cinco de Mayo in California, is due to be released soon from U.C. Press. It details the real history behind this American Civil War holiday and how it originated. Why do we in the United States celebrate the victory of an obscure battle that took place in Mexico 150 years ago? Cinco de Mayo is not celebrated as a national holiday in Mexico because it was created and first celebrated by Latinos living in California. Learning that the Mexican army in Puebla had defeated invading French troops on May 5, 1862, Latinos in California were overjoyed that freedom and democracy had won a victory over forces of slavery and oligarchy. Latinos all over the state rejoiced and celebrated with fireworks, patriotic songs, and impromptu speeches. Dr. Hayes-Bautista has stated, “Cinco de Mayo is important to California because it was invented here." He goes on to say that "It provides a collective identity for all Latinos, whether they were born here in California or immigrated from Mexico, Central America, or South America. It binds them together in an identity — it is as important to Latinos as the Alamo is to Anglo-Texans." Over the past year, Dr. Hayes-Bautista has been filming a documentary about the 1862 battle of Puebla, which will illustrate the rich history behind the Cinco de Mayo celebration as part of the American experience in California during the 1800s. Featuring interviews, period music, and visits to historical sites where the celebrations first took place, the documentary takes the viewer on a trip through history. Its focus is on educating children about the untold history behind the Cinco de Mayo holiday. Dr. David Hayes-Bautista is Professor of Medicine and Director of the Center for the Study of Latino Health and Culture at the School of Medicine at UCLA. He graduated from U.C. Berkeley and completed his MA and PhD in Medical Sociology at the University of California Medical Center, San Francisco. 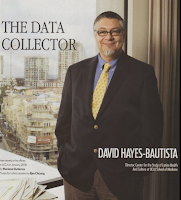 Dr. Hayes-Bautista’s research focuses on the dynamics and processes of the health of the Latino population using both quantitative data sets and qualitative observations. The Center for the Study of Latino Health and Culture combines these research interests with teaching of medical students, residents, and practicing providers to manage the care of a Latino patient base effectively, efficiently, and economically. His publications have appeared in Family Medicine, the American Journal of Public Health, Family Practice, Medical Care, and Salud Pública de México.